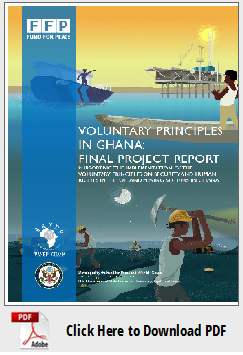 In 2015 when we began this program, the Ghana Government had not long before become the first African nation to sign onto the VPI. To get to this stage, there had already been a swell of momentum by existing VPI member companies and the Ghana Chamber of Mines (CoM) to expand VPSHR usage within the extractives sector. Beyond that core group of company and government stakeholders however, awareness about the VPSHR and its multi-stakeholder approach to mitigating security and human rights risks was limited. Civil society lacked the resources and knowledge about the VPSHR to constructively engage in a coordinated way, companies outside the VPI members and CoM champions remained largely unaware or skeptical of their usefulness, and many Ghana Government ministries were unaware that the Government had signed onto the initiative at all. Fast-forward to 2018, as we close out this program, and the Ghana Government is now taking the lead on a VPs National Action Plan (NAP) that has had extensive consultations from companies, civil society and other government stakeholders. 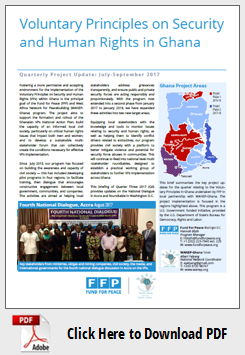 We see a sustainable national Ghana VPI Working Group that is supported by a funding coalition, meeting quarterly to support the NAP implementation and share challenges, lessons learned and successes on security and human rights issues from around the country. We see a cohesive group of Ghana Government champions from multiple ministries, who are all committed to working together within their positions to further specific policy areas on the VPSHR. We see a group of empowered civil society organizations who now have a place at the table and can represent community concerns in a trusted dialogue space, equipped with a deeper knowledge of the VPSHR. We see local stakeholders in five regions of the country working through established local dialogue platforms to engage on security and human rights concerns, using dialogue to resolve grievances peacefully and reporting incidents of conflict risk. We see international governments more engaged in VPSHR implementation, working together through their Embassies to support government and civil society activities and advocating for company engagement on the VPSHR. And finally, we see companies across regions and sectors sharing information, coordinating on common issues and proactively engaging with government, civil society and communities to address security and human rights risks. Since July 2015, our program has focused on building the awareness and capacity of civil society — this has included developing pilot programs in four regions, to facilitate training, then dialogue that encourages constructive engagement between local government, communities, and companies. The activities are aimed at helping local stakeholders address grievances transparently, and ensure public and private security forces are acting responsibly and proportionately. With the program now extended into a Phase 2 from January 2017 to January 2018, we will seek to expand these activities into two new target areas. Equipping local stakeholders with the knowledge and tools to monitor issues relating to security and human rights, as well as helping them to identify conflict drivers related to extractives, our program provides civil society with a platform to better mitigate violence and potential for security force abuses in communities. This will continue to feed into national level multi-stakeholder roundtables, designed to establish a practical working group of stakeholders to further VPs implementation across Ghana. 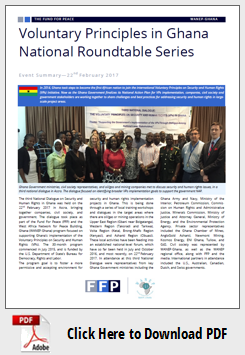 The third National Dialogue on Security and Human Rights in Ghana was held on the 22nd February 2017 in Accra, bringing together companies, civil society, and government. The dialogue took place as part of the Fund For Peace (FFP) and the West Africa Network for Peace Building, Ghana (WANEP-Ghana) program focused on supporting Ghana’s implementation of the Voluntary Principles on Security and Human Rights (VPs). The 30-month program commenced in July 2015, and is funded by the U.S. Department of State’s Bureau for Democracy, Rights and Labor. 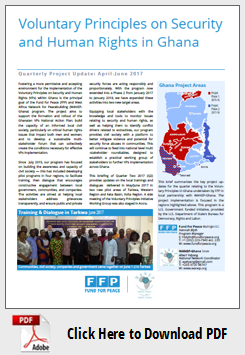 The program goal is to foster a more permissive and accepting environment for security and human rights implementation projects in Ghana. This is being done through a series of local training workshops and dialogues in the target areas where there are oil/gas or mining operations in the Upper East Region (Gbani near Bolgatanga), Western Region (Takoradi and Tarkwa), Volta Region (Keta), Brong-Ahafo Region (Kenyasi), and Ashanti Region (Obuasi). These local activities have been feeding into an established national-level forum, which have so far been held in July and October 2016, and most recently, on 22nd February 2017. In attendance at this third National Dialogue were representatives from key Ghana Government ministries including the Ghana Army and Navy, Ministry of the Interior, Petroleum Commission, Commission on Human Rights and Administrative Justice, Minerals Commission, Ministry of Justice and Attorney General, Ministry of Energy, and the Environmental Protection Agency. Private sector representatives included the Ghana Chamber of Mines, AngloGold Ashanti, Newmont Mining, Kosmos Energy, ENI Ghana, Tullow, and G4S. Civil society was represented by WANEP-Ghana, as well as the WANEP regional office, along with FFP and the media. International partners in attendance included the U.S., Australian, Canadian, Dutch, and Swiss governments.